A report consulting leading futurists presents a picture of what professional sports might be like in the next 25 years. Predictions are made in three increments (1-5 years, 5-10 years, 10-25 years), but the editors stress that the report only describes a possible future, not a most likely scenario. It is intended to be a conversation starter, and should not be read as a high-confidence forecast. The report covers eleven facets of the industry, including facilities, venues, players, fans, etc. The report was commissioned by the operator of a global food service and hospitality company and owner of a major professional team. Enhanced athletes and natural athletes might compete in separate leagues, with the leagues meeting in championship games between natural and enhanced players. All players will also be enhanced by courts/fields that increase performance. Video walls in stadium architecture; on-field holographic replays, glasses-free 3D tech in luxury boxes; VR rides in the stadium for fans. 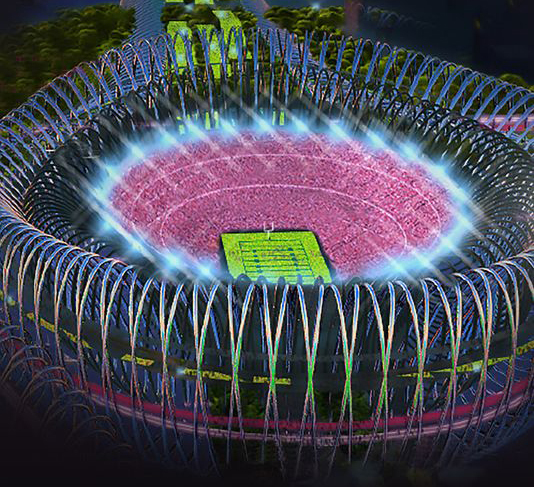 Smaller stadium footprints, enabled by self-driving self-parking cars and high-speed mass transit, allow stadiums to be built in city centers; modular/adaptable construction for variety of events; variety of fan areas. More alcohol sales (enabled by driverless cars, mass transit); more security cameras, facial recognition. Major networks lose control over content (to leagues, players, franchises, fans). Influence of network commentators and journalists wanes due to social media access. Major online platform (probably Google) buys multiyear broadcast rights for a league. Fans access content from many sources all at once. Fans integrate these streams into seamless, coherent, personalized viewing experiences. Watch a game via VR headset from the perspective of your favorite player. Celebrity gamers challenge traditional sports stars for adulation. Pro sports leagues embrace gaming. Talent eco-systems supporting esports (coaches, high school teams, ranking, etc). Hand-held controllers replaced by body movement and sensors. Tactile feedback interfaces and AR/VR enable remote play. Forced crowdsourcing of critical decisions, like whether to fire a player or coach after a scandal. When every fan is wearing a high-quality video device, fans become a prime source for broadcast and replay material. Team-designated ombudsmen will represent fans in major team decisions, and complex algorithms will predict fan reactions. Extreme sports will adapt a more formalized competition format. Robot trials will be run before humans perform to improve safety. Later, robotic exoskeletons and self-powered body suits further reduce injuries and death. Designated competition areas in national wilderness areas. Leagues with their own digital currencies (probably NOT based on Bitcoin). Seats chosen based on social media contacts, and social goals (families together, singles together, etc). Marketing focuses more on upper-mid-class women as mid-class wealth wanes. “The Future of Sports.” Josh McHugh, Po Bronson, Ethan Watters (editors). September 2015. Delaware North. “Bruins owner spearheads report on what sports will look like in 25 years.” Erik Brady. January 26, 2016. USA Today. Many of the ideas above are echoed in a May 2015 article from the Stanford Graduate School of Business. In particular we’re already seeing line-optimization, seat-optimization, on-demand on-device replays, big growth in digital tickets, women and children as a key demographic.